Hairy-Tongue Lousewort is a perennial herb with an erect leafy stem 20-40 cm tall, distinguished by its reddish-purple flowers with the upper lip priminently and densely covered with woolly red hairs, and with a hairless, incurved beak. Flowers are borne in a slender lax spike, with lanceshaped bracts. Calyx is shaggy-haired, sepals toothed. Leaves are alternately arranged, stalkless, lanceshaped, 4-8 cm long, deeply cut into numerous close oblong rounded-toothed lobes. 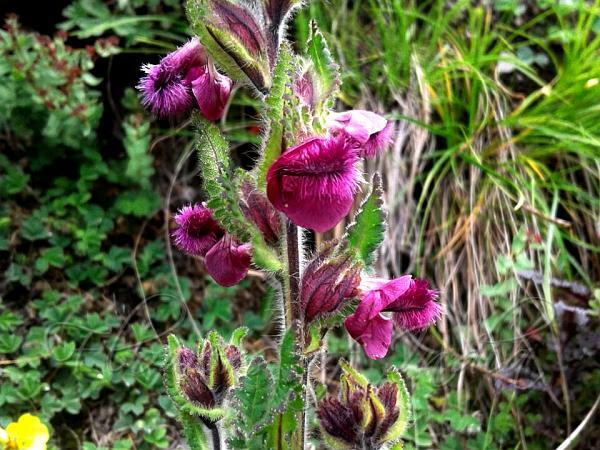 Hairy-Tongue Lousewort is found in the Himalayas, from Uttarakhand to SW China, at altitudes of 3000-4800 m. Flowering: July-August.